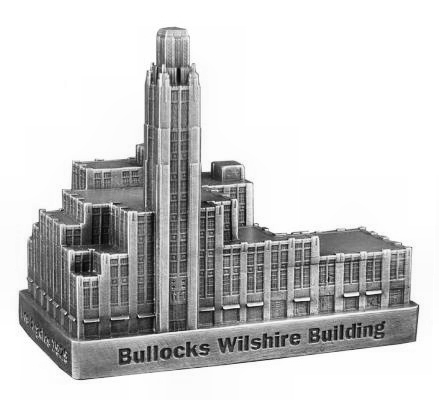 The Bullocks Wilshire building is located at 3050 Wilshire Blvd. in Los Angeles and was completed in 1929. This building was designed by John B. and Donald D. Parkinson and stands 241 feet tall with 12 floors. This building was one of America's first suburban department stores and was the first designed with the car in mind. Our pewter replica building stands 3-1/4 inches tall and is finished in antique pewter.